В 1923 году ВМС Франции объявили конкурс на летающие лодки разного назначения. Лучшей летающей лодкой для ведения прибрежной разведки и бомбометания была признана CAMS 33 конструкции Рафаэля Конфленти. Силовая установка лодки состояла из двух моторов Hispano-Suiza, ДальшеMore>>> размещенных тандемом между крыльями и работающих на один тянущий и один толкающий винты. Однореданный корпус лодки отличался чистотой обводов. Построили два прототипа CAMS 33, выполнивших первые полеты весной 1923 года: на первом прототипе носовая оконечность корпуса была выполнена скругленной, а второй прототип, CAMS 33В, был полностью оснащен оборудованием военного назначения, в остроконечном носу корпуса самолета разместили турельную пулеметную установку. Командир и второй пилот располагались бок о бок в открытой кабине, расположенной перед крылом. За крылом в корпусе имелась кабина для второго стрелка. В распоряжении каждого из стрелков имелись по два 7,7-мм пулемета. Корпус лодки CAMS 33В был изготовлен из дерева, обшивка - фанерная, обшивка поверхностей управления - полотняная. Верхнее крыло бипланной коробки выполнено плоским, нижнее - имеет небольшой угол поперечного V.
Небольшое количество серийных лодок поступило на вооружение эскадрильи 1R1 авиации ВМС Франции, дислоцированной в районе Шербура. В 1925 году шесть лодок CAMS 33 закупила Югославия. The latest type to be actually produced by the Chantiers Aero-Maritimes de la Seine at their St. Denis works is the C.A.M.S. 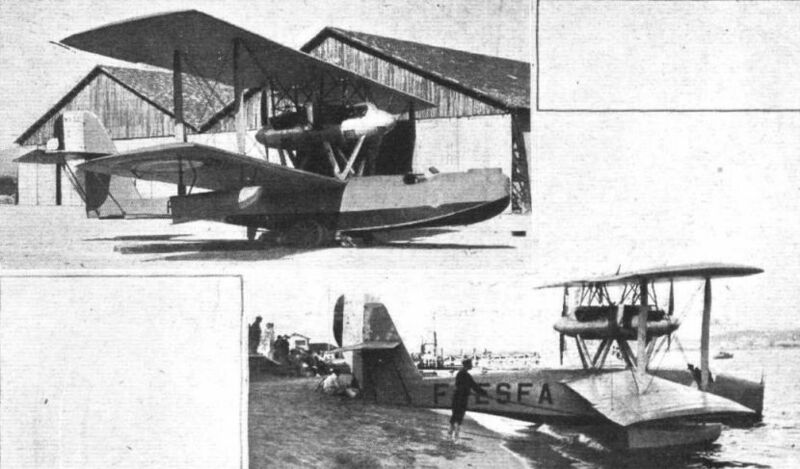 33 T, a twin-engined commercial flying boat, which is mainly remarkable for the fact that its engines are arranged in tandem, the front engine driving a tractor screw and the rear engine a pusher. The accompanying general arrangement drawings show the main dimensions, form, etc., of the C.A.M.S. 33 T, which is also shown in one of the accompanying photographs. It should be pointed out, however, that the machine shown in the photograph is the experimental type, in which the bow is pointed, while the production type will have the high vertical bow shown in the general arrangement drawings. Constructionally the C.A.M.S. 33 follows usual Conflenti practice - i.e., the boat hull is planked mainly with three-ply, although the bottom and step is reinforced with planking strips over the ply-wood. The hull form is, however, very different from those which one usually associates with boats designed by M. Conflenti. The sides are less flat than usual, although but slightly curved compared with boats of the "P" type, and the bottom, instead of showing the flat aft of the step and the concave step itself, is of the V-type, fairly pronounced in front and slightly less so aft of the step. The "hollow" step, although apparently quite suitable for a machine to be used mainly over smooth water, is unsatisfactory in anything of a seaway, and presumably with this fact in view the C.A.M.S. 33 has been given the V-bottom, curving slightly towards the chine. The central, or keel, portion is flat, in order to form a compromise between the quite flat and the straight V-bottom. The vertical bow designed for the production type is probably the result of experience with the experimental machine having shown the low pointed bow to give a "dirty" hull. There is still, however, but a single step. The pilot's seat is in front, near the bow, and the cabin extends aft from this to the trailing edge of the lower plane. There is seating accommodation in the cabin for eight passengers, and the machine carries a mechanic as well as the pilot, bringing the total capacity up to 10 persons. The seats are arranged along the sides, and the passengers look out through Triplex covered windows in the sides of the hull. As the root of the lower wing is placed in the roof of the cabin, there is nothing to obstructive view, which, as a matter of fact, is particularly good in the C.A.M.S. 33. The two engines, as already mentioned, are placed tandem-fashion between the wings. They are enclosed in a streamline nacelle, which should offer but little resistance, although the strutting necessary would appear likely to bring the power unit resistance up to a fairly high figure. From below, i.e. from the top of the hull, the engine bearers are supported by stout struts forming a letter W, as seen from the side. 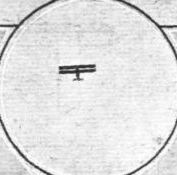 The top plane is supported on a somewhat elaborate structure of steel struts, forming a letter M in side view and an inverted A with diagonal ties in front elevation. The upper part of this centre-section structure is obviously intended to reduce the stresses in the top spars, there being but one pair of interplane struts on each side. The engine nacelle is provided with inspection doors, by means of which the magnetos, carburettors, etc., may be got at. The main petrol tanks are placed inside the hull, aft of the cabin, from which they are separated by a fireproof bulkhead. The biplane wings are of usual construction, with spruce spars and three-ply ribs. While the top plane is straight as in all Conflenti designs, the lower plane of the C.A.M.S. 33 has a pronounced dihedral. The wing section, although not one of the very high lift ones, is fairly deep, and allows room for spars of reasonably good depth, thus allowing of the strutting being reduced to one pair on each side. 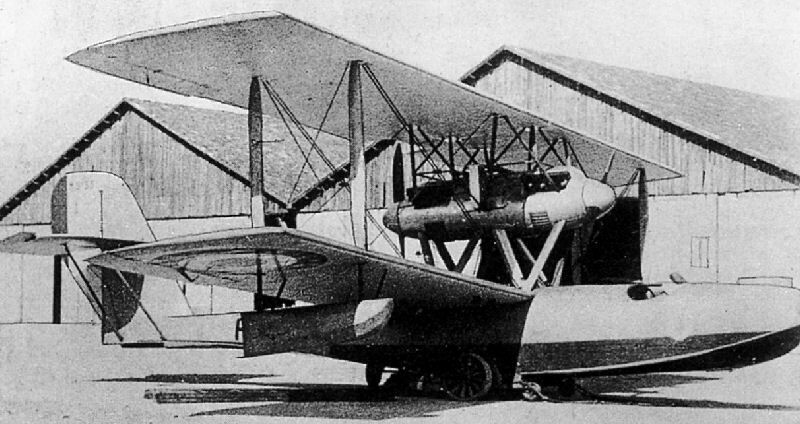 The tandem arrangement of the engines, although having been found in this country and in Germany not to be very satisfactory when placed on the wings, appears to give good results in the C.A.M.S. 33, possibly because it is away from the wings, and it certainly has the advantage that the centre of thrust is in the same position whether one or both engines are running. Incidentally, it is of interest to note that the C.A.M.S. 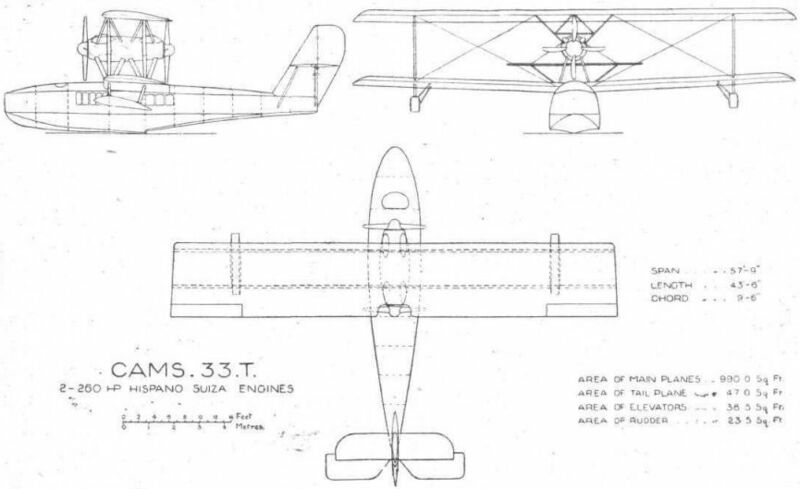 33 is capable of flying, although at reduced speed, on one engine only. This fact should make for good reliability, as in the event of one engine failing it should be possible to reach port on the remaining power unit. Following are the main characteristics of the C.A.M.S. 33: Length o.a., 13.27 m. (43 ft. 6 ins. ); span, 17.62 m. (57 ft. 9 ms.); wing area, 92 sq. m. (990 sq. ft.); weight empty, 2,500 kg. (5,500 lbs. ); weight of fuel, 540 kg. (1,185 lbs. ); useful load, 960 kg. (2,100 lbs. ); total loaded weight, 4,000 kg. (8,785 lbs. ); engines, two Hispano-Suiza of 260 h.p. each at 1,600 r.p.m., total 520 h.p. ; power loading, 17 lbs./h.p. ; wing loading, 9 lbs./sq. ft.; speed at sea level, 175 km. (108 m.p.h. ); stalling speed, 80 km. (50 m.p.h. ); speed with one engine running, 130 km. (80 m.p.h. ); climb, 3,000 m. (10,000 ft.) in 25 minutes; ceiling, 5,000 m. (16,500 ft.). The standard amount of fuel carried is sufficient for 300 miles, calculated on the assumption that there is a head wind blowing of 10 m. per second (22. 5 m.p.h.). THE machine which secured second place in the Course-Croisiere was the C.A.M.S. 33 Bis, shown in the accompanying photographs. This machine, piloted by Hurel, who, by the way, is flying a C.A.M.S. racer in the Schneider Cup race tomorrow, is similar in general lines to the C.A.M.S. 33T described and illustrated in our issue of July 26, 1923, except that whereas the 33 T has a cabin for passengers the 33 Bis has open cockpits, suitable for the mounting of guns, etc. The two Hispano-Suiza engines are mounted one behind the other between the top plane and the boat, one driving a tractor and one a pusher airscrew. Thus in the case of one engine failing the centre of thrust remains in the same position as before, and the trim of the machine is not affected, while there is, of course, no yawing couple as in the case of a twin-engined machine with the engines on the wings. 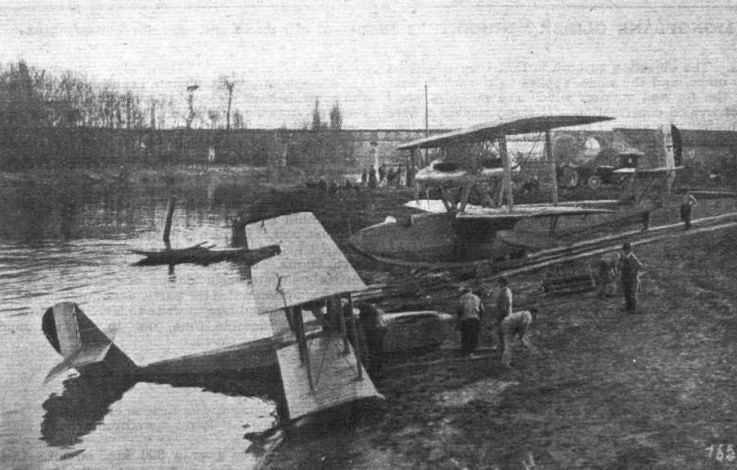 In connection with the French seaplane competition it is of interest to note that the C.A.M.S. 33 Bis, piloted by Hurel, made the flight from St. Raphael to Bizerta in 6 hours 15 minutes, as already stated, and that the tanks were not replenished, during the trip. The Chantiers Aero-Maritimes de la Seine, of which Mr. Lawrence Santoni is managing director, are designed by M. Conflenti, who was chief designer to the Savoia firm, while Mr. Santoni was their managing director. Since establishing himself in France, Mr. Santoni has already succeeded in turning out several very successful types of flying boats, in which class of machine the C.A.M.S. specialise, and visitors to Cowes and Southsea for the Schneider race will do well to watch the C.A.M.S. racer. As in previous years, our old friend Lawrence Santoni is exhibiting a flying-boat of the type which he and his chief designer, M. Conflenti, have developed during the last two years or so. This machine is known as the type 33B, and is a twin-engined flying-boat with the two Hispano-Suiza engines placed in tandem. In appearance the machine is typical of Conflenti design, and of very "clean" lines. The construction is very simple, and presents no unusual features, but a change is noted in the design of the step, which is no longer concave, as in the majority of the flying-boats of Conflenti's design. Presumably the fact that the machine is intended for work in the open sea is responsible for this change. The C.A.M.S. 33B is equipped with a particularly complete set of instruments and "gadgets," and carries, in addition to its bombs and machine-guns, a wireless outfit, multitudinous navigation instruments, etc. As a description and illustrations of the 33B were published in FLIGHT a few months ago, it is not proposed to go into details, but the main dimensions and performance may be of interest: Span, 17-62 m. (37 ft. 9 ins. ); wing area, 92 sq. m. (990 sq. ft.). Total loaded weight, 4,100 kgs. (9,000 lbs.). Speed at sea level, 175 km./h. (110 m.p.h.). Ceiling, 4,500 metres (14,700 ft.). Кабина с размещением пилотов бок о бок указывает на то, что это военный вариант CAMS 33. Гражданский вариант 33C выиграл французский заказ на 12 летающих лодок, доказав возможность совершить полет продолжительностью 18 часов при одной посадке. THE C.A.M.S. TWIN-ENGINED FLYING BOAT: No. 3 is the type 33 bis, while the lower photograph shows the type 33. The engines are Hispano-Suizas. One of these machines won second place in the recent competition across the Mediterranean and back (St. Raphael-Corsica, Bizerta, Corsica-Berre). TWO C.A.M.S. FLYING BOATS: In the foreground the type 31 single-seater fighter. Note the machine gun scoops in the deck. On the right, the experimental twin-engined commercial machine, type 33, in which the Hispano engines are placed tandem fashion. C.A.M.S.33 ON THE SEA: The larger photograph shows the type 33, while the inset shows the 33 Bis taking off. The C.A.M.S. 33 T in flight. 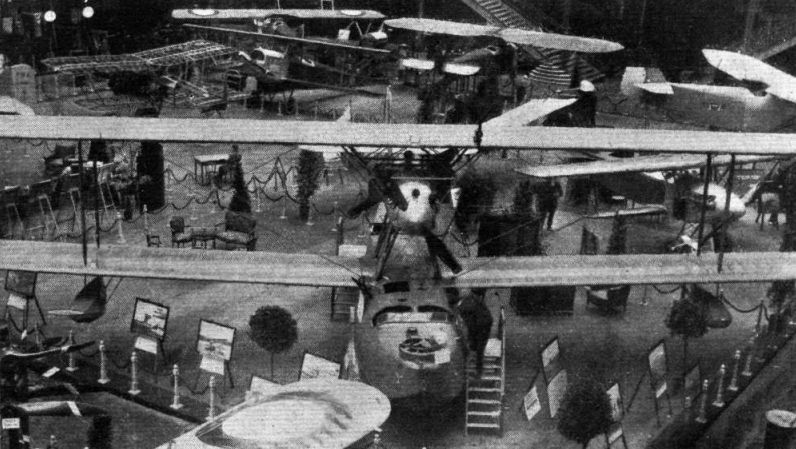 AT THE PARIS AERO SHOW: The'twin-engined C.A.M.S.33B flying boat (Hispano-Suiza engines), designed and constructed by Chantiers Aero-Maritimes de la Seine.